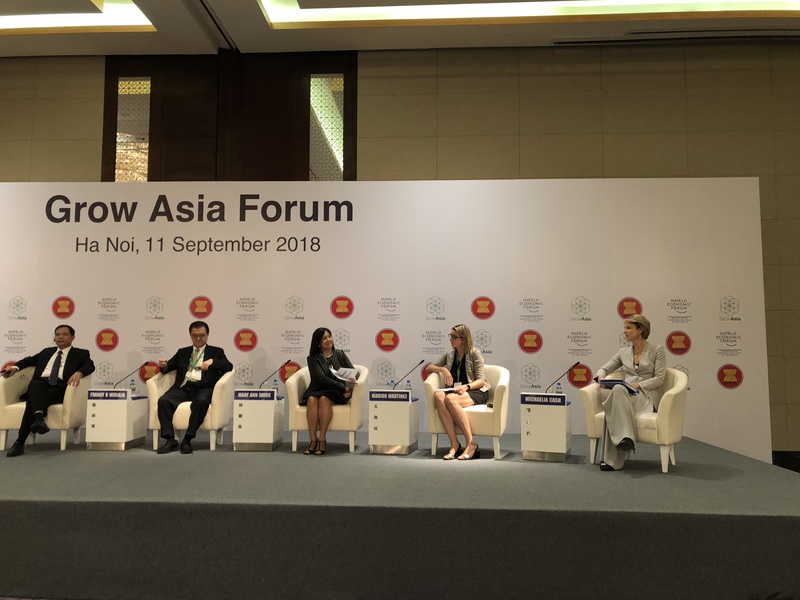 Our Foundation (SFSA) participated in the recent Grow Asia Forum in Hanoi, Vietnam. We used the opportunity to present our work in insurance, and to learn from others. Grow Asia is a multi-stakeholder partnership platform that enables collaboration and catalyzes action. The event supports national and regional agricultural development priorities of the Association of Southeast Asian Nations (ASEAN). Grow Asia was established by the World Economic Forum (WEF) in partnership with the ASEAN Secretariat. The partnership draws on the WEF’s New Vision for Agriculture, which facilitates multi-stakeholder partnerships across the world. It aims to deliver food security, environmental sustainability, and economic opportunity through agriculture. This year’s Grow Asia Forum was the fifth of its kind. The theme was “Innovations for Results: Exploration and Inspiration”. Attendees came to learn from one another, make new contacts, and be stimulated by new knowledge. They left with a strong sense of the purpose, progress and exciting innovations across the whole Grow Asia network. Representing SFSA were Hervé Thieblemont, Asia Seeds Lead & SEA Regional Head, and Dao Xuan Cuong, Country Director, Vietnam. Hervé presented our work on risk management during a session dedicated to Agricultural Finance and Insurance. SFSA is currently taking its experience from East Africa and South Asia to bring innovative insurance solutions to countries such as Indonesia and Myanmar. This Forum was an excellent opportunity for SFSA to learn from others. Dao Xuan Cuong and Hervé Thieblemont met numerous further leaders from international organizations and institutions. These included Nestlé, Corteva, Yara, Phoenix, Swiss Re, and the International Finance Corporation.